What is the Best Flea and Tick Medicine for Dogs? We love our pets. But if you’ve ever had to deal with a flea infestation in your home, there may have been a brief moment when you second guessed that relationship. So what can you do to protect your pet? In the best case scenario, these pests (no, not “pets”) are annoying. You can feel them jumping on you and it seems like you’re just a host to transport them from one area of your life to another (it’s the worst when you get them in your car). But that’s not where the real danger lies. Fleas can cause itching and fatigue and can carry a host of diseases, including lyme disease and, of course, the bubonic plague (though it is highly unlikely today). But what is the best flea treatment method to keep your dog safe? 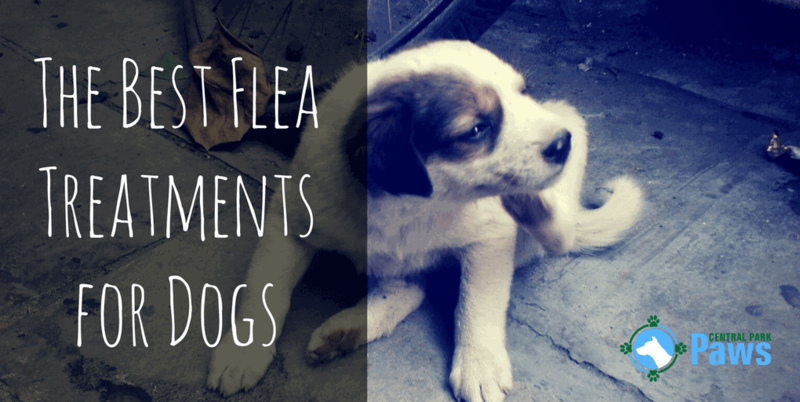 The best flea treatment for dogs starts with getting rid of any critters they already have. First of all, you should bathe your furry friend regularly with some sort of flea shampoo. There are a number of options available from name brand shampoos to natural ones with no added chemicals. Oatmeal baths are also effective. Keep your pet inside. Fleas live outside so keeping your animal in the house limits their exposure to these insects. Of course you should exercise your pup often but when you do, try to stay away from wooded areas or areas with a lot of underbrush. Use some sort of flea prevention. The best way to get rid of fleas is to never have them in the first place. We’ve listed the most popular ones below. See which treatment works best for you and your canine and stick with it. Be consistent. The life cycle of a flea can last up to 6 months so just because you don’t see them now doesn’t mean you should stop regular treatments. Choosing a dog bed with cedar filling can also make a good impact but be sure that the buggers aren’t just jumping around to other parts of your home. There are a number of ways to prevent your dog from getting fleas or killing any infestations he might already have. These are the most popular and effective methods but we’ve also listed some natural flea treatment options at the bottom. Remember, the best flea treatment is the one that works for your dog and your lifestyle. Flea drops, such as Advantix and Frontline, are the most common form of flea prevention for your pet. The drops are applied to the nape of the neck (just above the shoulders) and last for 30 days. Monthly reapplication is required but is generally quick and easy. Drops are arguably the best flea treatment because you only have to think about it once a month and it doesn’t take much time. These drops can prevent flea larvae from developing and also kill any adult fleas that are already on your pooch. Many brands can kill ticks and lice as well. Be sure to pick the right flea drops for your dog (based on size) for best results and to avoid any side effects. Also make sure to wear gloves when applying as these drops can be harmful to humans. wait at least a couple of hours before petting your dog to allow the medication to dry. Oral flea medication (pill) is the most effective type of treatment and prevention available. The advantages of flea pills is they can work as quickly as four hours and can come in chewable tablets for dogs who have trouble taking pills. The disadvantages are that these oral flea meds for dogs may require a vet’s prescription, they don’t guard against ticks or other parasites, and they can kill adult fleas or eggs but not both. Pills are often used in conjunction with drops as the pills kill the current pests and the drops prevent new ones from breeding. This one-two punch is probably the best flea treatment option available. Dog flea collars can be used for treatment or prevention and can last up to 8 months. This means you don’t have to worry about reapplying the drops every month or remembering to give your dog his pill. The flea collars work best when combined with another treatment method such as shampoos or topical medications. The cons of flea collars is that one, they aren’t the most stylish accessory and two, they are less effective than drops or pills. If your dog spends a lot of time outdoors and in heavily wooded areas, a collar plus another method may be a good idea. Flea shampoos should be used in conjunction with one of the prevention methods. There are many options available including “natural” shampoos made without any harmful chemicals. Shampoos can kill fleas up to one day but they only affect adult fleas, not larvae or eggs. Flea sprays also should complemented by a prevention method to keep infestations from coming back. Sprays can kill adult fleas, larvae, and eggs. Many repel mosquitoes as well. The flea and tick sprays’ effectiveness can last up to 2 months, killing and preventing future infestations. Picking a treatment or prevention method is up to you and your pup. By far, drops are the most common but if your dog has a skin reaction to it or you know that you’ll probably forget to reapply it every month, that might not be the best fit for you. If you don’t mind the look and are in an area with a low risk for fleas, a collar is a good option that you will only have to replace every 8 months or so. 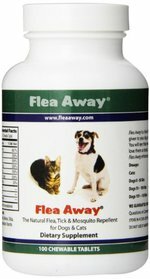 If your flea problem is pretty serious, oral medication, possibly along with another method, might be necessary. Topical medications such as drops are the most popular and possibly best flea prevention method. Generally applied once a month, these drops work quickly and are highly effective. Some dogs have mild to serious reactions to this treatment though so monitor your pet closely for a few days after applying. 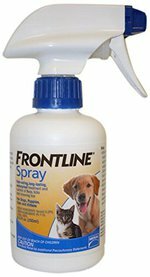 Frontline is probably the most popular brand for flea drops but there are mixed reviews on its effectiveness. Some people swear by it and others say it doesn’t work at all. Apparently this discrepancy is most likely due to two reasons. One, Frontline does not work on a certain strain of Florida fleas, and possibly other varieties. And two, there are a lot of knockoffs being sold under the Frontline name. If you decide to go with Frontline, make sure the manufacturer is Merial. There have been a lot of stories of adverse effects from the Frontline drops so make sure to read them before making a decision. Based on the risks and reports of the medication not working well or at all, this is not a product we would recommend. If you are already using Frontline and it is working for you, then you should be fine but if you are thinking of switching, there are better choices available. 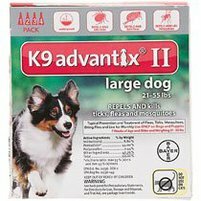 K9 Advantix II for dogs is the second most popular flea drop medication after Frontline. Though that order may change soon. It seems that a lot of people have been jumping ship from Frontline due to its inefficacy. Advantix has been working consistently well for over a decade with very few side effects. For first time dog owners, this is a good choice to start with. Many people don’t need any more than a monthly (could be twice a month, depending on your situation) application and regular bathing. This medication kills and prevents against fleas and ticks as well as mosquitoes and lice. And it doesn’t wash off so it will remain effective even after swimming and bathing. Your veterinarian may suggest using Vectra 3D if other methods aren’t effective. 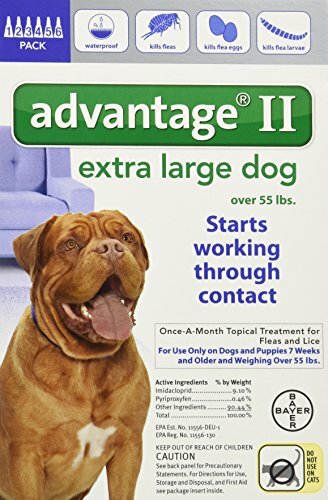 Vectra uses a slightly different formula than Advantix or Frontline that kills fleas on contact, not after they bite. Not only does it kill and repel fleas, it also works on ticks, lice, mosquitoes, sand flies, and mites, keeping your pooch safe from many biting insects that can spread diseases. This is the same medication that you can get from your vet but typically at a much cheaper price. While Vectra is more powerful, it can also be more dangerous. There are more than a few accounts of dogs having serious reactions and even a few deaths. Please consult your vet before using these flea meds if you think your dog may be at risk. Of course any topical medication may cause an allergic reaction so be sure to monitor your dog closely after first applying Vectra. You may have never heard of PetArmor. They aren’t the biggest or most well known brand but they make a good product. And for a great price. In fact, they use the same active ingredient, fipronil, in the same concentration as Frontline Top Spot but it costs about 50% less. Seriously. And it works faster (in about an hour). Also, there haven’t been as many reports of ineffectiveness as Frontline nor have there been issues with bait-and-switch knockoff replicas. So if you’re thinking about trying Frontline or are already using Top Spot, you may want to give PetArmor a shot. That way, if you have the same issues that other Frontline users are having, at least you won’t have spent as much to find out. PetArmor kills fleas, a variety of ticks, and lice and lasts for up to a month. Another product from Bayer, Advantage II is also a best seller. Unlike Advantix though, this flea treatment only protects against fleas – adults, larvae, and eggs. It doesn’t guard against ticks, lice, or mosquitoes. So why would you choose Advantage II over Advantix? If you aren’t having any infestation problems now, then there’s really no reason. But if no other flea medication seems to work, Advantage II is worth a shot. This is an especially good choice if your dog is often in high flea prone areas that you can’t control such as wooded areas near your house or out on hunts. With this product, you shouldn’t need to do more than apply the formula. There’s no need for any of the other preventative measures, though regular bathing is always recommended. Depending on your situation, pills can be a great choice for keeping your dog safe from harmful parasites. Be sure to choose carefully, however, because while some medications prevent future infestations, others only kill current ones. Used in tandem with another method, these can be very effective at keeping your pet flea free. This is a once a day tablet to get rid of current infestations. It can start working in as little as 30 minutes and is very effective. If you are struggling to get ahead on your flea problem, this is a good way to wipe out the adult fleas who are laying eggs and start on a prevention method to keep them from coming back. The CapGuard name may be misleading since it doesn’t actually “guard” but rather kills but these pills are very effective at exterminating the buggers. Keeping a few tabs on hand in case your mutt brings home some unwanted friends is a good idea. The pricing is also very reasonable. You can generally pick up a six pack of CapGuard for less than $20. Unlike CapGuard, Flea Away, as its name suggests, repels fleas rather than killing them. It also repels ticks and mosquitoes. Topical medications like drops act by poisoning the insect when it bites your pet’s skin. However this product keeps the buggers from ever biting your pooch in the first place. If your canine is allergic to insect bites, waiting until the pest sinks its teeth in can still cause problems. These pills are a great alternative to that. The tablets come in a chewable form and are liver flavored to make administering them a pleasant experience rather than trying to shove a pill down your dog’s throat. These are particularly handy when you plan on going into wooded areas like camping trips to keep the blood suckers off your dog. And at around $15 for 100 tablets, they’re pretty inexpensive. Of course the downside to pills like these is that you have to give your dog a pill up to three times a day, depending on its size. CapGuard from Sentry and CapStar from Novartis are very similar not only in name but also how they work. CapStar also only treats, but does not prevent, flea infestations. These are used when you have an outbreak that normal methods like shampoos, spray, and bombs can’t fix. Usually prescribed by your vet, CapStar can be bought without a prescription, often at a lower price. You will want to keep an eye on your dog for a few hours after giving him the pill. Fleas tend to bite hard while dying so your pup may act erratically for a while. Make sure not to stay too close in case the fleas decide to jump ship and start biting you. It’s not a pleasant experience. Give your dog plenty of water as CapStar can cause dry mouth. There is very little, if any, difference between PetArmor FastCaps and CapGuard or CapStar. All three use the same active ingredient (Nitenpyram), all three act within 30 minutes, and all three last up to 24 hours. PetArmor also only works on fleas and is not effective in preventing re-infestations. Unlike its topical treatment, FastCaps isn’t any cheaper than its competitors and actually is a little bit more expensive. The big difference between PetArmor and Novartis or Sentry is the amount of Nitenpyram they use. For dogs over 25 pounds, CapStar and CapGuard have 57 mg while FastCaps has 54 mg. So you’re using PetArmor and it doesn’t seem to be working well enough, you might want to switch to one of the other brands with a higher dosage. On the other hand, if your pet has too much of a reaction from the other meds, trying FastCaps may be a good option. Flea collars are a great option if monthly treatment isn’t a good choice for your dog. They can last up to 8 months and can be as cheap as $5. However, be warned that some collars leave a greasy residue, have an odor, and/or can be toxic if ingested. 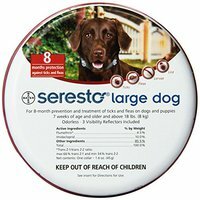 Bayer has another solid flea treatment product in its Seresto Flea and Tick Collar. 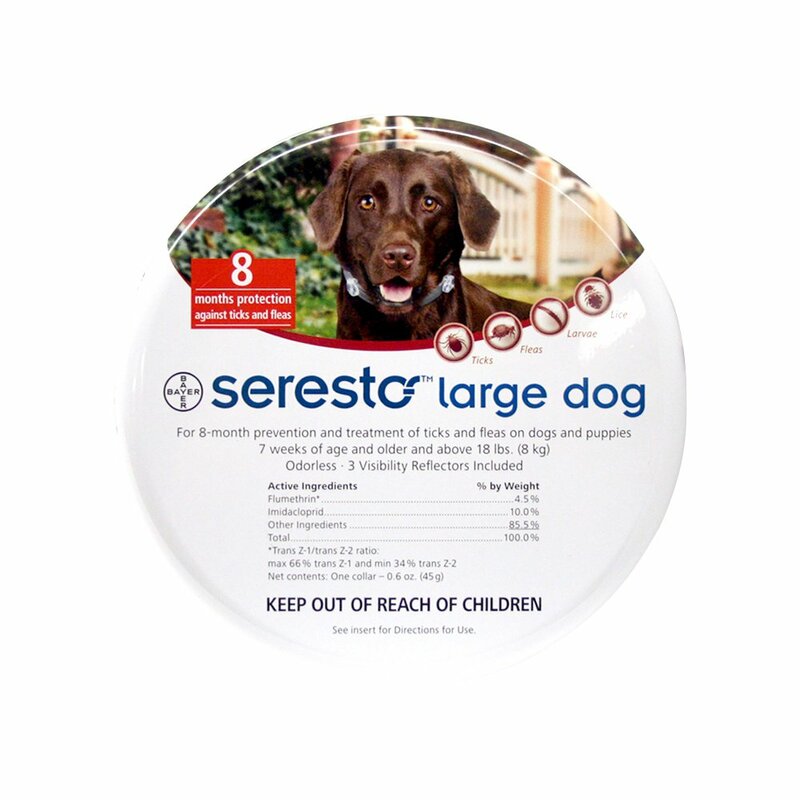 The Seresto flea collar is actually very unique in that instead of just spraying a chemical onto the collar, Bayer uses the same ingredient it uses in its Advantage topical formula and embeds it into the collar directly. Compared to the Seresto, the Hartz Ultraguard is a steal. It costs literally 10 times less than the Bayer collar and has a similar effectiveness. Like any of the products listed, there are mixed results. Some owners found absolutely no difference after using the collar, even finding ticks directly under the collar. This could be due to a number of reasons, whether they got a “bad batch” or forgot to activate the collar by stretching it. Overall though, the Ultraguard collar works very well in killing and preventing fleas and ticks from hounding your hound. Please be warned that there will be a noticeable smell from the collar for the first 3 days after activating it. After that, the collar should be effective for up to 7 months, though many people have noted much shorter times. The Scalibor Protector Band is a nice medium between the Seresto and Ultraguard. It’s priced at a bit below the middle of the two and has a few features that make up for the other collars’ cons. Unlike the Hartz collar, the Protector Band doesn’t have an odor to it. All three of these flea collars use different active ingredients so if your dog is having a bad reaction to one, you might want to try switching to another brand. For reference, Scalibor uses deltamethrin as its active ingredient, compared to the flumethrin used in Seresto and tetrachlorvinphos in Ultraguard. The Protector Band doesn’t protect quite as long as the other brands, only making it to 6 months before you need to replace it. Also, unlike the Bayer collar, the Scalibor is toxic. So if your dog likes to chew his collar, this will not be a good fit for you. The Adams Plus flea collar is very similar to the Ultraguard collar. They both use the same active ingredient, tetrachlorvinphos, both last up to 7 months, and are the least expensive flea collar options in this list. The Adams collar kills and protects against adult fleas, larvae, and eggs. It also kills and repels adult ticks, larvae, and nymphs. There have been a larger than average number of accounts that the Adams Plus collar is completely ineffective. At this price point (less than $10), it could be worth giving Adams a try though to see how your dog reacts to it. If you find that this collar is completely ineffective on your pup, make sure that it is correctly activated. If you notice your pooch having a reaction to the collar, discontinue use immediately. As well as cleaning and freshening your pet (no one likes a smelly dog), many shampoos can also prevent flea eggs from hatching. Depending on your flea prevention strategy, these can be used in conjunction with one or more of the other methods to make sure that your pup stays safe and healthy year round. Another product from Adams Plus is their shampoo with Precor. It’s the most common flea and tick shampoo around and for a good reason. The formula is a double step approach, using natural ingredients like aloe, oatmeal, and lanolin as well as chemicals such as Precor to kill fleas, flea eggs, ticks, and lice. You should know that the Adams Plus shampoo only treats the problem, it doesn’t prevent reinfestations other than keeping eggs from hatching for 4 weeks. On top of keeping your mutt pest free, it also cleans and deodorizes as well as improves coat health, and leaves fur soft. There are very few noted side effects though it has been known to cause drooling and/or sensitivity in a small amount of pets so watch out for any reactions like this when using. The Hartz Ultraguard shampoo is the second most popular option. It kills fleas and ticks and includes oatmeal which also relieves itching from bug bites or dry skin. And if you’re not a fan of the smell, it comes in citrus scent as well. Even though it’s just as effective as the Adams Plus, the Hartz shampoo is half the price. Though this may be due in part to it being more watered down than its competitor. Also like Adams Plus, this shampoo only kills the fleas and ticks currently on your pet, it does not prevent reinfestations. If you want to go off the beaten path a little, BioSpot’s Active Care shampoo is a great option. It’s very effective at killing fleas, ticks, and lice and it kills flea eggs and larvae for up to 28 days. It also leaves your pup’s coat soft and smells pretty good doing it. The biggest con is that it’s on the high end, price wise, for flea shampoos. But if you’ve tried other shampoos without much success, give BioSpot a shot. If you still can’t get rid of the fleas, the next step up probably will have to be prescribed by your vet. If you’re looking for something more holistic, Natural Chemistry’s shampoo is a great choice. It’s chemical free, using the natural power of cinnamon oil, cedar wood oil, vanillin, and oatmeal to kill and repel fleas, ticks, black flies, and mosquitoes for up to 7 days. The oatmeal also moisturizes and rehydrates dry or itchy skin. And if you’re a fan of the holiday season, many people describe the smell as “Christmas in a bottle” because of the cinnamon and cedar oil. Because it’s 100% natural, you can use Natural Chemistry on puppies without fear of dangerous side effects. However, there have been reports of this shampoo staining light colored dogs’ fur. If your pet is light colored, it’s a good idea to test a small amount on their foot or tail and waiting a day to see if their coat will be affected. Lastly, you should know that this shampoo doesn’t lather like a regular shampoo so you’ll have to use more but it’ll be easier to wash out. A lot of people have been getting confused about SynergyLabs Richard’s Organics shampoo. They advertise “100% natural solutions for better health” but the bottle states that it has “74.5% natural ingredients”. While this may seem contradictory, what they likely mean is that 100% of the active ingredients are all natural (peppermint oil, eugenol (Clove oil), cedar oil, cinnamon oil, rosemary oil, and vitamin E) but the inert ingredients include some man made materials. SynergyLabs also claims that their formula kills fleas and repels mosquitoes but many people have found that instead of killing the fleas, it merely puts them to sleep. 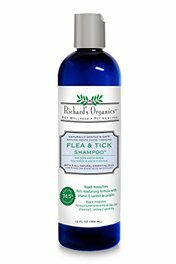 The essential oils used in the Richard’s Organics shampoo are common homeopathic cures for flea infestations and also provide many other benefits such as arthritis relief and sedation for separation anxiety. However there are some studies suggesting essential oils may be dangerous for dogs. Consult with your vet if you are on the fence about using this shampoo. Finally, if you have a sensitive nose, the cinnamon smell can be overpowering. Honestly, this is not a product we recommend. For a shampoo, it’s expensive, and it doesn’t even do its job. There are much better options out there. DO NOT use this shampoo on cats as cinnamon oil can be toxic to them. There are basically two types of flea sprays; ones that get rid of the parasites you already have and ones that keep those buggers from getting on your dog in the first place. The first kind of flea spray is great for clearing your house, car, etc from current infestations while the second type is best when used as a temporary prevention method for when you want to take your dog into a flea-prone area such as a hiking trip. Vet’s Best Natural flea spray serves double duty as a flea killer and bug spray. It kills fleas, flea eggs, and ticks on contact, but also repels mosquitoes. Vet’s Best uses peppermint oil and clove extract as its active ingredients and contains no pyrethrins, permethrins, or cedar oil which means it is safe to use around children and not harmful to plants. Unlike many other sprays, Virbac Knockout comes in an aerosal can. Also unlike other sprays, you should not use it directly on your pets. Instead, you spray your whole house (one can covers up to 2100 feet). There’s no odor (though you should still open a window to avoid breathing toxic fumes) and won’t stain your furniture, but we recommend testing on a small section first. Once applied, the Knockout spray lasts up to 7 months, killing fleas and ticks. It doesn’t kill the eggs but the new adult fleas will not be able to reproduce. While it may take up to 2 weeks for all of the fleas to be completely eliminated, 80-90% will be gone immediately. 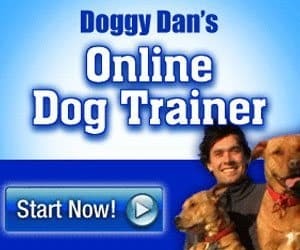 Strangely, it says that it is available through licensed vets only but it’s clearly for sale online. Wondercide is one of our favorite flea treatment products. However, it is much more expensive per ounce than the other sprays and it isn’t as effective as non natural products. The harsh truth is that poisons kill things. It’s difficult to efficiently kill one thing while keeping everything else as completely safe. You’ve got to find a medium that you’re comfortable with. Like the Wondercide and Vet’s Best flea sprays, Dr Greenpet is all natural and contains no harmful chemicals. It’s also safe to use around children and pets, made in the USA, and smells good. Unlike the other sprays, however, this flea spray does not kill adult fleas, eggs, or larvae, it only repels them. If you are planning on going for a hike with your pet in wooded areas, you could give your pup a good spray down of this and not have to worry about him bringing home any hitchhikers. And it lasts up to 2 months so one bottle will get a lot of mileage. One of the major pros of this spray is that it lasts up to 30 days, meaning a spray down a month should be good enough for most dogs. On top of getting rid of fleas, it also kills a variety of ticks, including brown dog ticks, American dog ticks, lone star ticks, and deer ticks. And if you’ve got a young one on your hands, it’s safe for puppies 8 weeks and older (most treatments are for dogs 12 weeks and up). One of the downsides of the Frontline spray, though, is that it can be expensive. Frontline recommends that you use one or two spray pumps PER POUND of body weight. So you’ll go through the 8.5 ounces pretty quickly even if you only have a medium sized dog. And if you have a Great Dane, you’ll probably need a second mortgage if you decide to stick with this spray. Also, since it works from the “inside”, reacting to your dog’s body, it cannot be used on carpets or other surfaces. If your pet has trouble with spray bottles, one solution is to wear gloves or other protection like a plastic bag, spray it into your hand, and then rub it into your pup’s coat. Either way, it’s a good idea to rub the solution in after application to make sure that it soaks in properly. Cedar trees have been a long time cure for flea infestations. You can find cedar shavings in many dog beds and some higher end dog houses are made from cedar. It naturally repels fleas, ticks, moths, and many other pesky pests. You can use cedar oil on your dog but be careful as some essential oils are toxic to animals. Only use a small amount until you are sure that your canine will not be affected. This can be a pro or con depending on your preference but please note that cedar oil is quite potent and your dog will smell like a forest for a couple of days. Borax is used in everything from cleaning detergents to ant killer. It can also be effective against fleas and ticks. It has no smell and there is no danger of absorbing it through your skin. It’s also very inexpensive. Sprinkle some around your home as well as throughout your yard if you have a current infestation (borax does not kill eggs, only adults). The downside of borax is that it can cause breathing problems in cats or other small animals if they ingest over 5mg. Prolonged exposure can cause side effects so do not use as a preventative. Diatomaceous Earth is one of those super substances like borax that can handle a variety of tasks from cleaning pools to killing pests. Also like borax, DE has no smell, is fairly cheap, and can be used often with few side effects. The difference is that DE has even fewer risks. A dusting of diatomaceous earth on your carpets every 3 to 4 weeks, followed by a vacuuming the next day, should be enough to keep your home flea free. Oatmeal baths are a pretty well known cure for dogs with fleas. Other than having to clean your tub afterwards, there really aren’t a lot of downsides to it and it is very effective. The simplest way is to soak uncooked oatmeal in the bath and then rub it into your dog’s coat. After 10 minutes, rinse and you’re done. If you’ve gotten this far and read all the reviews, you probably realize that there is no perfect magic pill, or collar, or drop, that will work every time for every dog. Each product has its own pros and cons, whether it be price, odor, effectiveness, or how often you need to reapply. Read any product review for flea medication and you’ll generally find 80 pet owners raving about how great the product works and 20 other people ranting about how their dog had violent allergic reactions to it. Different breeds, different environments, and even different individual dogs will cause different results. What works great for one dog might cause focal seizures in another. 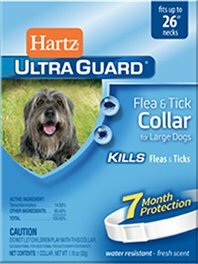 And while your dog may be flea free with a low cost option like the Hartz Ultraguard collar, your cousin’s pup may require an expensive monthly topical treatment to keep him safe and healthy. Many times, however, the bad reactions are due to operator errors. Using more or less of the product than recommended, not properly activating the collars, or simply applying the medication incorrectly. Finding the best flea treatment for your dog isn’t an easy task. You may need to do your own testing to see what works best for you and your companion. This guide should help you to compare your options but no one product works 100% of the time on 100% of dogs. And be sure to follow instructions properly. *This guide is not written by a medical professional nor do any opinions constitute medical advice, please consult your veterinarian before using any flea treatments.